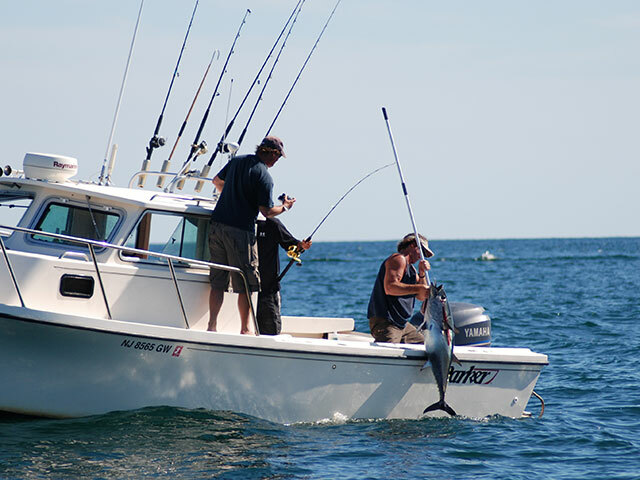 Learn how to capitalize on New Jersey's hot bluefin tuna bite.. When water temps hit the high 70s during the New Jersey summer, the bluefin will often move down deep below the thermocline. In these conditions, you can target the bluefin tuna using a combination of chunking and jigging. 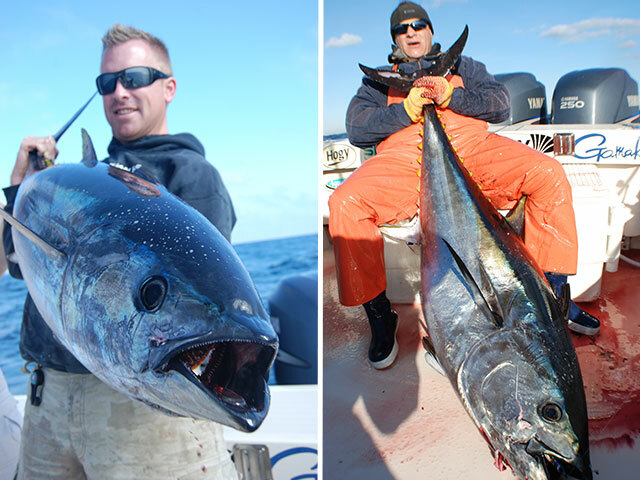 Local pros deploy an array of vertical jigs on high-speed reels to horse in bluefin tuna up to the 80-pound class. 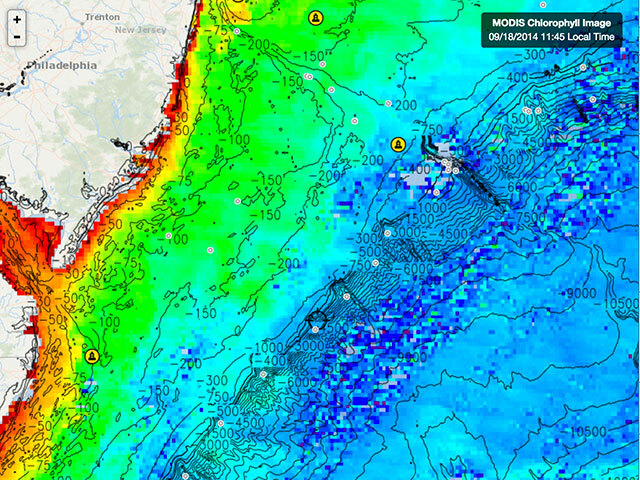 This FishTrack Chlorophyll image shows clean, blue water moving in over the offshore canyons and ledges. Using satellite imagery to find color and temperature breaks over structure will help you pinpoint potential hot spots. Action can get hot and heavy in New Jersey's nearshore waters when tuna season fires up. Here, a bluefin comes aboard while others bust bait in the background. Bluefin tuna are one of the most targeted commercial species in the ocean because of the fish's high grade of sushi. Many local anglers are involved with bluefin tuna conservation. Capt. 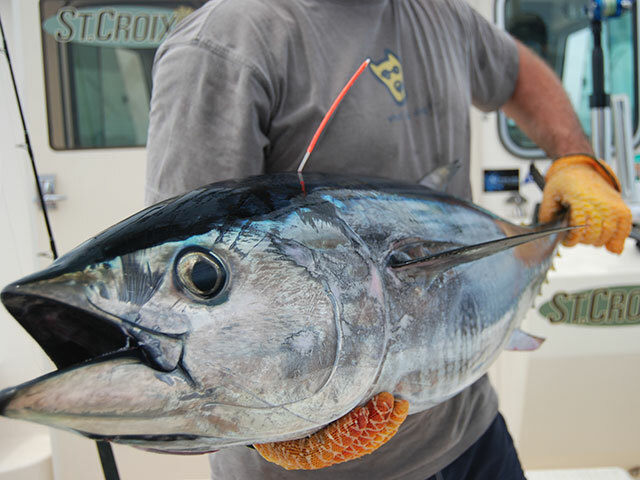 Jim Freda is a tagging partner with the Atlantic Tuna Project. The bluefin tuna is a fish for all seasons off of New Jersey. Garden State anglers catch bluefin tuna from 30 to 125 pounds anywhere from late May right on through December. Anglers target bluefin using a variety of methods, including trolling, jigging, chunking and sight-casting. Choosing your technique depends on the time of year, and here is a chronological look at how to fish for bluefin throughout the long New Jersey season. It's always exciting when the first bluefin show up in late May. These fish are usually in the 40- to 60-pound class and can be anywhere from 20 to 60 miles off Manasquan Inlet. In May, bluefin moving up from the south in search of bait including anchovies, butterfish, herring, tinker mackerel, squid and sand eels. For this reason, it has traditionally been a trolling game to track the tuna down. Having good local intel can point you in the right direction, but if that's not available a little science goes a long way. Bluefin are drawn to structure such as ledges, drop-offs, ridges and wrecks, along with temperature breaks and boundaries of clear and dirty water. Once you spot other forms of sea life such as diving birds and feeding whales in a promising area, it's a dead giveaway that the tuna won't be far behind. Couple that with a temperature or turbidity break along a bottom contour and you'll want to troll that line. Locating temperature breaks and turbidity edges that go from dirty to clear water before leaving the dock will pay off in spades. By using satellite imagery you can jot down the GPS coordinates of prime areas and plug them into your chart plotter. New mobile apps such as the FishTrack App make it even easier. You can save all of the information, including waypoints, right on your phone or tablet and the app works offline so you can access all of your saved imagery right on the boat. If a lot of smaller baits like anchovies or sand eels are present, then rig trolling rods with small feathers, Reel Seat spreader bars, daisy chains or Clark spoons. If much bigger baits are present including squid, mackerel, or herring than you can drag large Zuckers, jets, and cedar plugs along with 9-inch Sterling Tackle or Canyon Runner squid spreader bars and Green Machines. Trolling ballyhoo on Joe Shutes way back in the spread or on a trolling planer produces some of the bigger tuna. The way-back method involves staggering two or three rods way back behind the boat between 150 and 300 yards. Trolling speeds vary between 4 and 5 knots. You can use a 24- to 32-ounce planer to bring baits down to about 40 feet. Deep-diving plugs will also work if you do not have planers, but change out the standard trebles to the heavy-duty variety. Commercial scallop draggers work the offshore grounds for a period of time each spring, and trolling around these vessels while they drag the bottom can be a gold mine. The bluefin get in behind these boats and eat the scraps that dislodge as the draggers rake the bottom. The real magic happens, however, when the scallopers stop and begin to shuck their catch, tossing a smorgasbord of bycatch over the side. As discards flow out of the dragger’s chute, a tantalizing chum slick teases the bluefin in. When this happens, getting in as tight as you can to the scalloper and baiting a hook with fresh scallop guts will result in an instant hook-up. To score bait you can often trade with a cooperative scalloper, or purchase five-gallon buckets of guts at some marinas. We have also discovered that unsalted, shucked clams put on a hook and drifted back into a slick work equally as well. Flats of these clams are available in local tackle shops. Scallop guts or shucked clams should be fished on a 60-pound fluorocarbon leader with a 7/0 Gamakatsu circle hook. I use 60-pound FINS braid and conventional gear when the tuna are up to 80 pounds. If bigger bluefin in the 80- to 125-pound class move in, I switch to an 80-pound fluorocarbon leader and 80-pound braid. Around the time the scallopers disappear, jigging and chunking become the go-to techniques for bluefin. Surface waters warm into the upper 70s to low 80s during the heat of the summer months, and this will push the bluefin down below the thermocline into cooler, deeper waters, making trolling less effective. Summer bluefin in central New Jersey can range from footballs of about 30 pounds up to 80-pounders, with the much larger bluefin usually absent. I always use a combination of chunking and jigging together when I set up on the tuna grounds. When chunking, I prefer 40- to 60-pound wind-on fluorocarbon leaders and increase to 70 pounds if the bluefin just happen to be over 80 pounds. The leader is tied to a 6/0 or 7/0 Gamakatsu Octopus inline circle hook that’s hidden in the bait. I prefer a whole sardine, and it’s important to use some light copper rigging wire to close the mouth of the bait shut. This will prevent the sardine from spinning and instead cause it to flutter in a more natural manner. New Jersey’s prime winter bluefin action comes from casting stickbaits or poppers at surface-feeding fish. Prime time for topwater bluefin is usually the middle of November right through the end of December, weather permitting. During this time we see a southerly migration of big 100- to 200-pound bluefin moving south only a few miles off the beach. 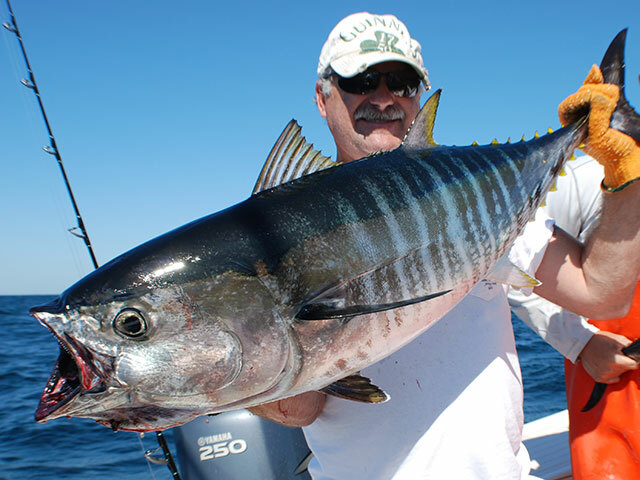 Casting topwaters to big tuna requires specialized spinning rods and big, tough reels. 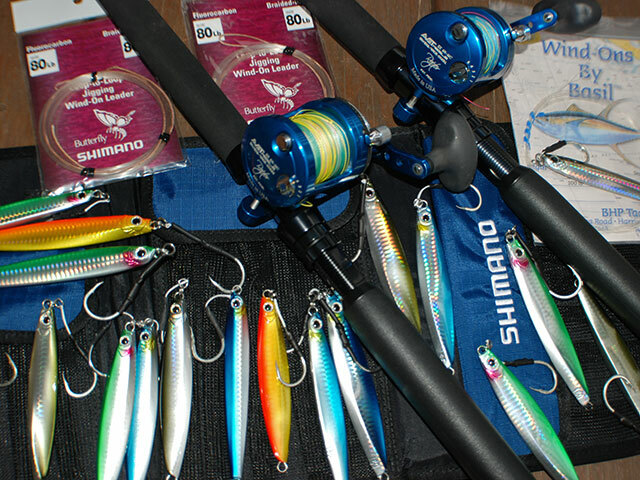 I use heavy-action St. Croix, Spinal, Shimano Terez or Van Staal rods and match them with a high-end spinning reel like a Shimano Stella or Van Staal that can exert the necessary drag you’ll need to put a tuna in the boat. Most anglers know how to fish a popper but fishing a stickbait is different. These lures are lipless and made to dart and slash just below and across the water when the angler imparts a low sweep with the rod followed by a quick turn of the reel to take up the slack. This motion is then repeated while varying your speed. When you get a bluefin bite on a topwater lure or stickbait, you'll know it! This is one of the most exhilarating bites the offshore world can offer. Hang on and pack a lunch.